All car manufacturers test their vehicles prior to production. Tesla prides itself in taking a Silicon Valley approach, shortening the procedure where ever they can by making the process more efficient (ref 10). The biggest game changer for Tesla was over the air updates-OTA, in which Tesla can update vehicle software without having customers bring vehicles into their service center, saving them time and money. OTA’s also allow Tesla to do some late stage testing in the field via their customers. GM has also finally started using OTA updates (ref 8) on their Chevy Bolt EV, so Tesla no longer has a leg up on OTA updates in this case. In addition to OTA updates, Tesla does its testing in house to speed up the iteration process, but it is not clear if they do more in house testing than GM, as GM also has extensive in house test facilities also. 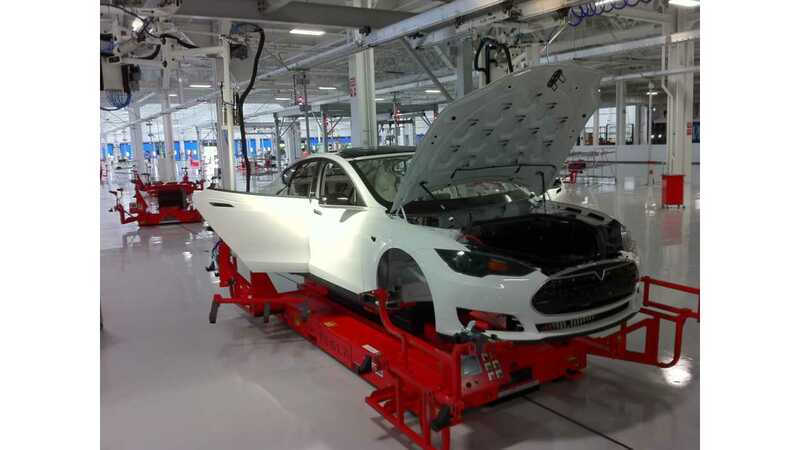 One thing that both Tesla and GM have in common is that their pre-production testing is comprised of three parts: mule testing, early prototype vehicle testing and, in part 3 they test their production line….and of course the vehicles that get produced on the production line. Let’s look at the details and how long all this takes. GM has some complicated names for their pre-production vehicle and manufacturing testing. For those interested in the details reference 2 and 3 (below) are a good read. 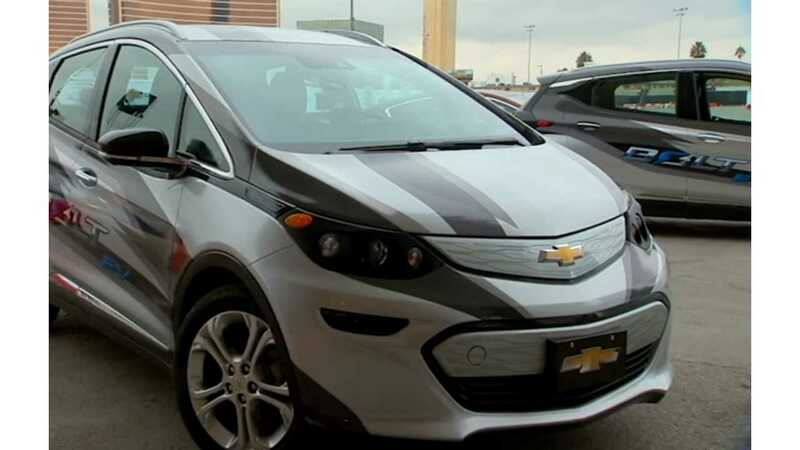 General Motors' pre-production Bolt EV test vehicles - IVER, or integrated engineering vehicle release, numbered between 55 to nearly 100 (depending on source - ref 2 and 4). These vehicles were tested for approximately 1 year following mule testing, and were first spotted 1.5 years prior to production start.  “These integration test vehicles include virtually all of the parts that will go into later production examples and are generally built from production tools. These vehicles usually appear 18 to 24 months before production start. 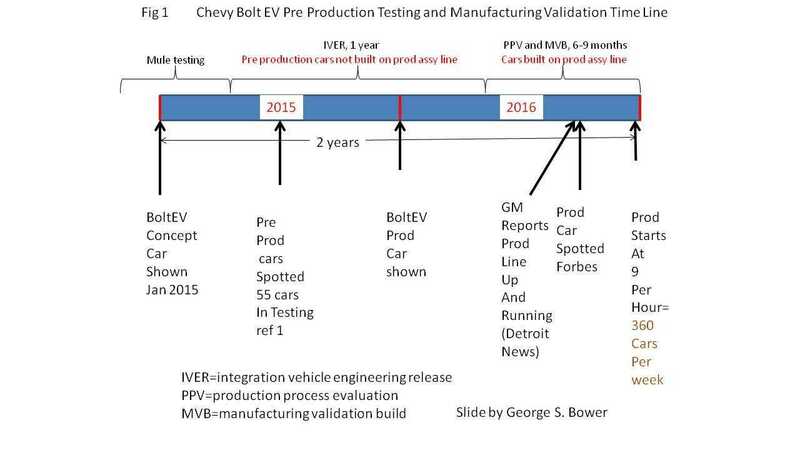 In the case of the 2017 Chevrolet Bolt EV, almost 100 integration test vehicles were built starting in early 2015. 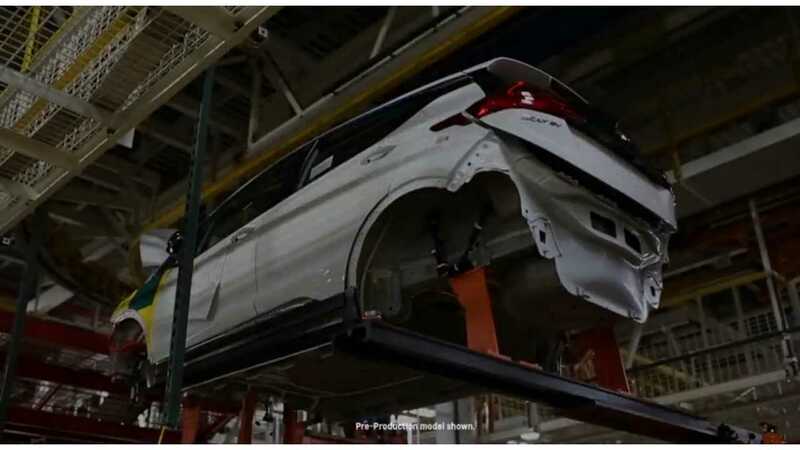 GM’s manufacturing validation of vehicles made on the line (and also testing of all the production line machines) starts 6-9 months before formal production. It is broken into 2 phases: PPV (or production process validation) and MVB or (manufacturing validation build). 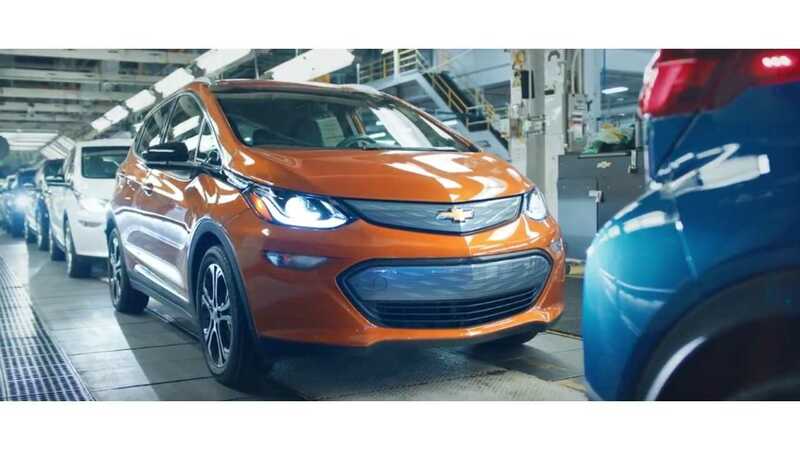 For the Chevrolet Bolt EV the entire pre-production testing and manufacturing validation lasted 2 years from the date they first showed the Bolt EV concept vehicle. Quite a feat since the Bolt EV had an all new battery pack, power train and body. When GM fired up the line, they had an initial production rate of 9 vehicles/hour (ref 5) = 360 cars per week. Faster than Tesla's initial production rate on both the Model S (15-20 cars/week, ref 15) and model X (39 cars/week, ref 12). 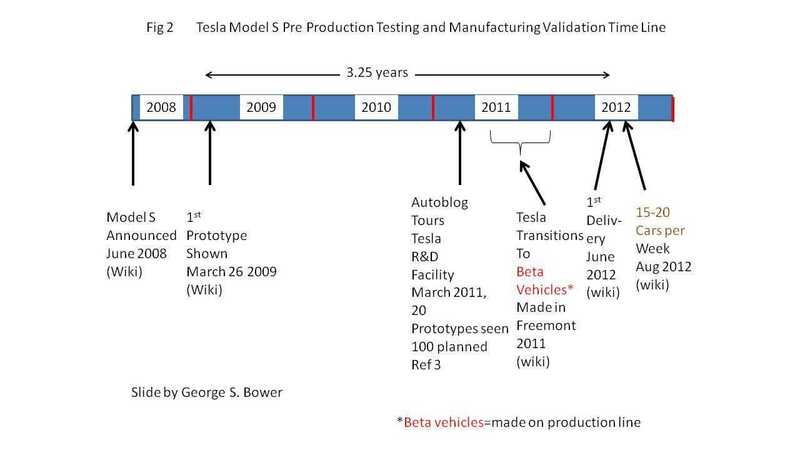 Tesla pre-production testing is also broken into 3 stages just like GM: mule testing, prototype testing of vehicles (that look like the production vehicle but are not made on the final production line, referred to as “Alpha” vehicles), and vehicles made on the production line referred to as “Beta vehicles” (ref 9,10 and 11). Tesla’s Model S alpha test fleet consisted of approximately 100 vehicles and, like GM, are put thru various and tortured testing to validate the design. Alpha testing lasted nearly 2 years for Model S.
Beta testing of Model S came next. 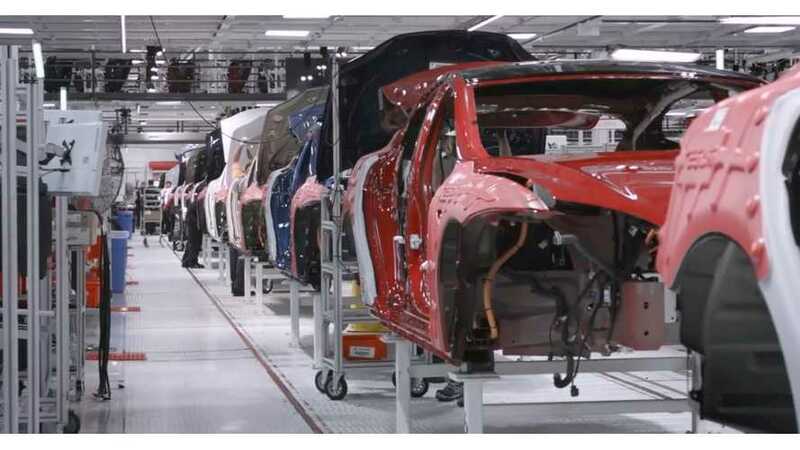 The entire pre-production time line for Model S start to finish was approximately 3.25 years and initial production rate was 15-20 cars per week. Model X pre-production testing lasted 3.6 years including all the delays due to problems with the falcon wing doors and motor over heating issues while pulling a trailer (wiki). In late 2015, Tesla announced that most of its engineers were already working on the Model 3, not Model S or X ( ref 16). 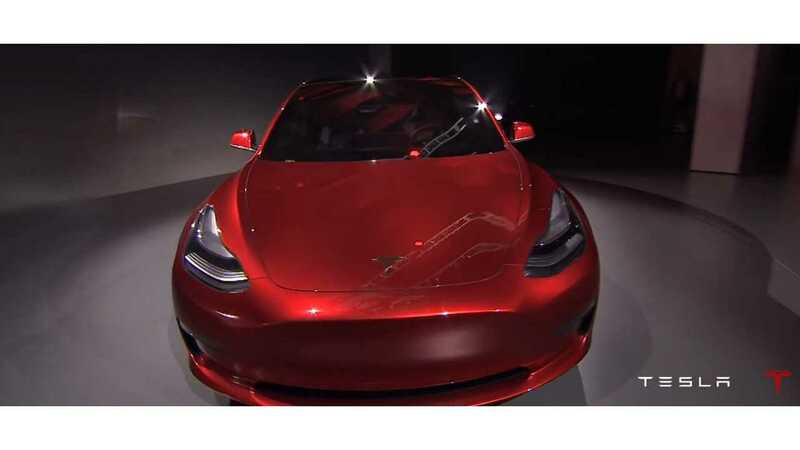 The prototypes were unveiled on March 31, 2016 and the number of reservations for Model 3 exceeded Tesla’s imagination. 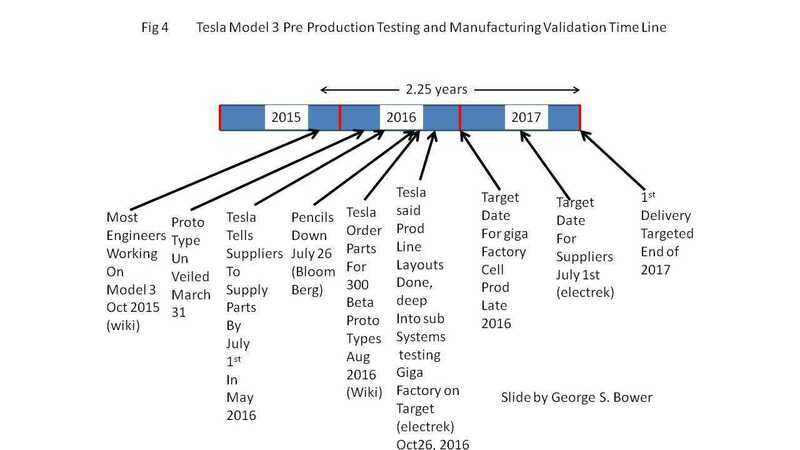 As such, Elon Musk decided to expedite the program, telling suppliers they needed to supply production parts in around 1 year or 6 months prior to 1st prodroduction vehicle target date (ref 20). Coincidentally, we can note that this lines up well with what GM uses for production line testing so it’s not out of line with accepted practices at GM. 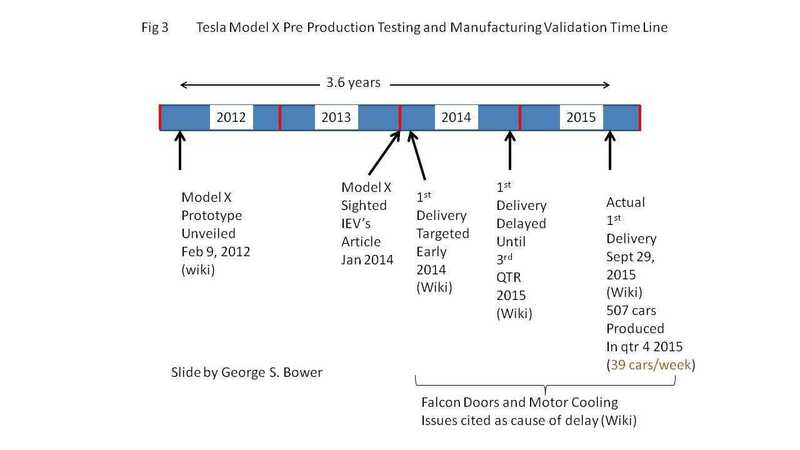 Also note that the Tesla Gigafactory is targeted to manufacture cells by end of 2016 (ref 22) but as of yet we have not heard of that startup, but even if that date slips somewhat it is still around 1 year from 1st vehicle production - so not a show stopper for getting first delivery about one year from now. Also note suppliers still have 6 months to start delivering production parts. 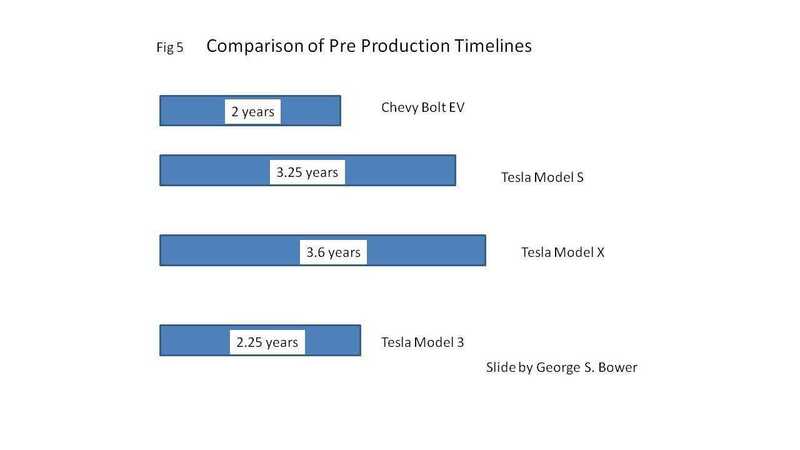 Let’s look at how the Tesla Model 3 timeline compares to the Chevy Bolt EV and the Model S and X. Can Tesla still make their target date of end of 2017? GM and Tesla’s Model S had visibly more cars testing than Model 3. In the case of the Bolt EV we had sightings and articles describing a test fleet of 55 vehicles a full 1.5 years from production start. In Model S case we had articles written and test vehicles sighted a full 1.75 years prior to production start. Here we are 1 year away from production start for model 3 and how many reported sightings of test fleet have we seen? Close to zero. What do you readers think? 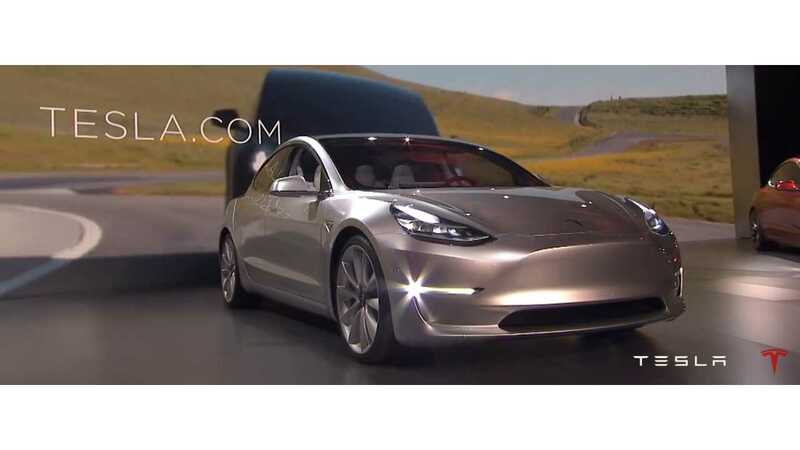 Will Tesla make their bogey or not? About the author: George Bower is a retired mechanical engineer with over 20 years experience in gas turbine power systems including the design and development testing of the auxiliary power units for both the A320 and Boeing 777 commercial aircraft. He leased a 2012 Chevy Volt for 3 years, and currently drives a Tesla Model S.